I will write an analysis this week. The effort to keep the chickens/ducks/guinea fowl safe from the hawks has had its own complications. We originally built the coop (10x16) and pen (10x20) to hold less than 50 birds. Although it’s easy to limit population growth of chickens and ducks (collect the eggs), the guineas lay eggs in hidden forest nests. Our 25 guineas became 70 guineas over the Summer. The coop today has 64 guineas and 11 chickens - 75 birds in close proximity. Normally they roost from dusk to dawn and are running around the farm during daylight hours. By limiting them to the coop during hawk hunting hours, they have less free outdoor time. The consequences are that they have increased proximity and less fresh air movement. Chocobo, one of our Buff Orpington chickens, is low on the pecking order. This week, while confined, she was pecked by other birds and had mild bleeding of her comb. We cleaned her up, applied Vetericyn (a spray on antibiotic), and isolated her into the mini-coops we use for raising young birds. She’s healed nicely. Snow, one of our Brahma chickens, developed an upper respiratory infection and began sneezing violently. We’ve done our best to keep the coop open on cloudy days. We’ve dug out all the bushes (buried under 7 feet of ice) that the poultry uses to hide from hawks. Given that Boston just broke all historic winter records, that’s been an ongoing battle. Snow the chicken is doing well now that she has more outside time. I’ve tried very hard to minimize travel this year, but I was asked to join an important strategic planning session at a foundation in California, support one of our industry partners by giving a keynote in Dubai, and chair the Standards Committee in Washington. Kathy has had to keep the farm running during my time away. The dogs miss me and we tend to defer maintenance tasks and the more physical projects until my return. Balancing my various work tasks, my farm tasks and travel makes me want to use Skype as much as possible, minimizing travel time so that I can serve all the organizations, people, and creatures in my life instead of sit in airports. As a farmer, my role is maximize the life quality of every creature on the farm. As a CIO, my role is to make a difference with my staff, my country, and the world. In 2014, we acquired all the technologies necessary to maximize farming efficiency, enabling me to use my nights and weekends most wisely. As we ramp up production and scale, we may need to bring on some part time help to support Kathy when my job responsibilities fill the 24 hour day. Our Spring planting is now done, both hoop house seed planting and indoor seedling germination. The BIDMC COO asked why my fingertips are cracked. My upper extremities are now farmer’s hands and not surgeon’s hands. I look forward to the thaw of the next few weeks and exciting projects we have planned for late spring including new mushroom production, tree planting, fence mending, wiring the cider house to support the move from hand cranked tools to powered tools, and replacing the 30 year old farm driveway. In our modern era, each of us will have 5 or more jobs. My heart leads me to farming but my brain drives me to make a difference on as large a scale as possible. For many years to come, I will shovel manure on nights and weekends while “fertilizing” ideas in my technology day jobs. The thaw has begun. This week, for the first time in 2015, we’ll have daytime temperatures above freezing. 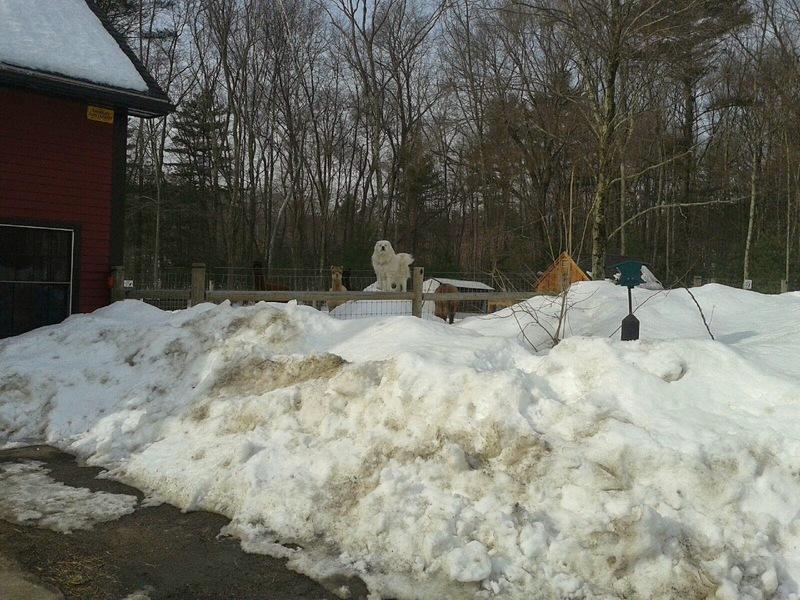 The 8 foot snowbanks are starting to recede, although the Great Pyrenees can still look down on the 6 foot fences. 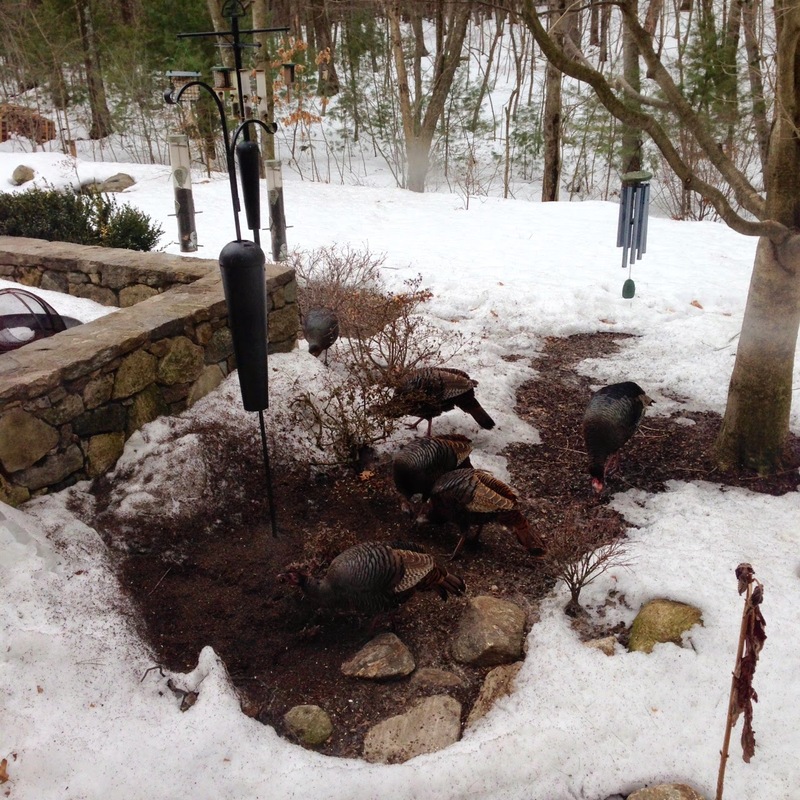 As the snow melts, creatures are becoming more active. Birds are gathering hay for nesting (I cleaned out all the birdhouses in February), skunks have wakened from the dormant state and are wandering around the farm (I can smell them), and the fisher cats are prowling around the barn at night looking for prey. The dogs have been barking for hours every night, keeping the barnyard animals safe from predators. 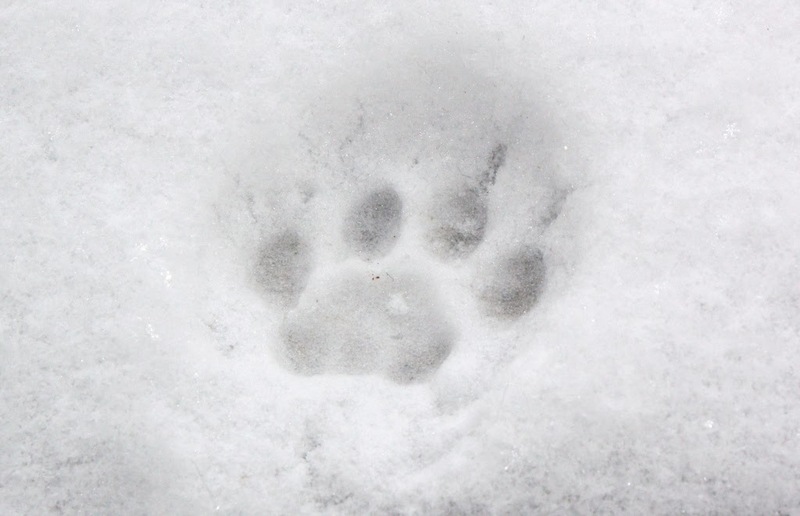 This morning, I noticed fisher cat tracks around the entire poultry area. Everyone is safe and healthy. This weekend, I’ll finish planting the spring greens - 3 different kinds of spinach and 5 different kinds of lettuce. The Federal Alcohol and Tobacco Tax and Trade Bureau is nearly ready to approve our cider making application as a bonded cider winery. I’ve made 8 different kinds of hard ciders as test batches for personal consumption and once licensed, we can ramp up production. We’ll have 6000 pounds of apples each season in the next few years. I’ve been designing a premium beverage - Halamka’s India Pale Ale with Apple - HIPAA. It builds strong bodies twelve ways and protects your privacy! I’m off to Dubai on Saturday night to give a keynote and Kathy will be running the farm until Tuesday. I really hope the fast melting snow does not become a fast melting flood in my absence. On Monday, I wrote a brief op-ed for the Wall Street Journal about the reality of cloud computing. You can read the full article here. Infrastructure as a Service (IaaS) - your applications outsourced to someone else’s servers. Platform as a service (PaaS) - a set of foundational software tools for building your applications on someone else’s servers and software. Software as a service (SaaS) - a set of applications, created and operated by a third party which does not require installation of local hardware or software. You subscribe to comprehensive remotely hosted functionality. I concluded that outsourcing your mess to someone else to host is not cloud computing. Instead IT leaders should focus on a variation on SaaS, which I called “Outcomes as a Service”. Software and hardware are one component, but the combination of business processes, people, and technology work in concert to achieve a desired result. Payment is made when that result is delivered. Examples are the athenahealth EHR/practice management/billing service, the Cornerstone Learning Management System service, and the Workday financial applications. 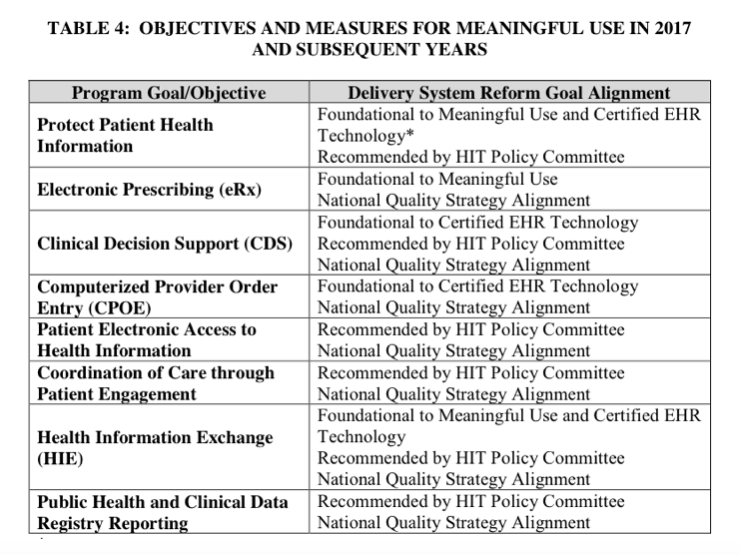 CIOs throughout the country are struggling with IT scalability - the capacity to meet the automation needs of the business given regulatory demands (ICD10, Meaningful Use, HIPAA Omnibus Rule, Affordable Care Act), limited time, and relatively fixed resources. Often IT is asked to delivered unplanned work, within current budgets, and without disrupting current projects in process. It’s like asking 9 women to gestate a baby in 1 month. One of the few ways that a CIO can stay sane (other than resource leveling and governance, which I discussed last week ) is to have the flex capacity to deliver outcomes for a price. The business can be told that an Outcomes as a Service provider exists and the business can have as much of that service as they can pay for. The CIO enables the service but does not provision it or operate it. As I’ve written about before, the CIO’s role is increasingly diverse. I’ve watched CIOs crumble under the strain the job, which often seems overwhelming - demand exceeding supply, constant change with complete reliability, and perfect security with ubiquitous access. Relying increasingly on Outcomes as a Service vendors, freeing up the CIO to spend more time with business owners and governance activities, is likely one of the most successful tactics to enhance CIO job retention and satisfaction. The snow, ice and sleet continues. February was the snowiest month we have ever had in Boston had with 64.8 inches. It was also the second-coldest February on record. I’ve attacked the endless frozen tundra of Unity Farm with the Terex front loader,an ice chipper, and a stainless steel SnowEx salt/sand spreader. I try to use Calcium Chloride or a Magnesium Chloride mix which is safer for the plants and animals. We’ve gone through 250 pounds of salt and 250 pounds of sand every weekend in 2015. The March weather thus far has varied between a high of 43 and a low of zero F. The snow melts a bit, then refreezes. It’s like chunky concrete at this point. The industrial sized snowblower attachment for the Terex arrives this weekend, but I’m not sure a snowblower can help with the glaciers that now surround the farm. Next year, I’ll move the powder before it becomes a solid. The bees continue to struggle with the record low temperatures and precipitation. We started the winter with 11 living hives and now we have 7. In the Spring, we’ll refill a few of the hives by moving a portion of the bees and queens from existing hives to empty hives - a kind of forced swarming. The queen-less hives will make new queens. We’ve also ordered some “mini-hives” of overwintered Russian bees from Western Massachusetts. These small hives are called a “nucleus” or “nuc”. I’m sure that folks overhearing our conversation were worried when my wife announced that she purchased two Russian Nukes. Last week, I wrote about my conversation with the hawk that visited the chicken coop and killed a guinea. The hawk did not return, but unfortunately, it told two even larger friends about the coop. Kathy noticed an enormous hawk sitting on the coop roof one morning. Last weekend, I found the dismembered body of Belle, the duck who we nursed back to health after a serious eye infection. The hawks broke her next and ate about half of her upper body. I buried her under 6 feet of snow, since I cannot dig the frozen ground. We’ve changed the daily schedule for all the poultry at Unity Farm. During the lean times for the predators, when all natural food sources are covered with snow, we’ll keep all the coops and pens locked until 4pm each day, since the peak of the hunting seems to occur between 9am-3pm. Once the snow melts and the trees begin to leaf out, we’ll restore the usual daylight freedom that the poultry have always enjoyed. Our task as farmers is to maximize the quality of life of the creatures at Unity farm, while also keeping them alive! We’ve ordered all our seeds for 2015, so hopefully I can plant peas next week and begin to prepare the overwintered raised beds for the Spring growing season ahead.